Discover the truth about attending a yoga retreat as we put these common yoga retreat myths to rest. 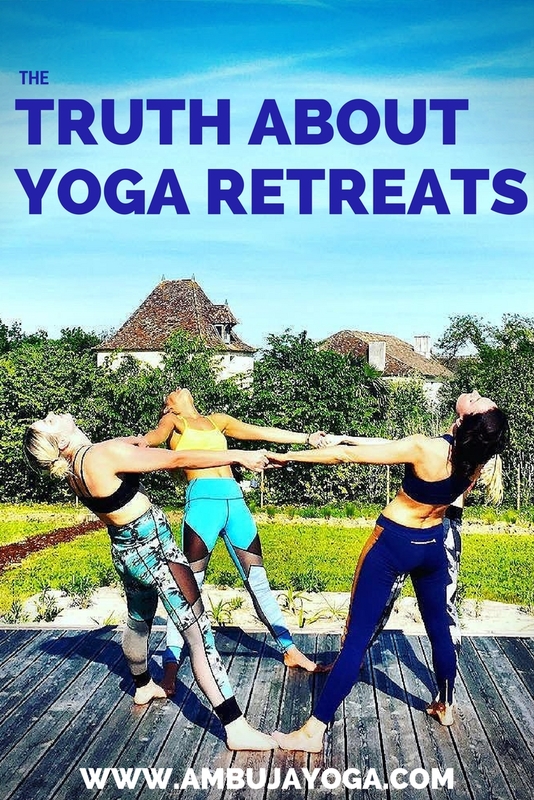 There seems to be a lot of myth about attending yoga retreats and a lot of fuss in the yoga community about being a perfect yogi with the perfect body and the green juices, the incredible Instagram account and the fancy leggings, but yoga retreats are for real people like you and me with all of our lovely imperfections and uniqueness. So lets be real for a sec and get to the bottom of these myths that keep us stuck in a mindset of fear and uncertainty. Myth 1: You have to be a rockstar yogi to attend a yoga retreat. Nope. Absolutely not. You don’t have to be a rockstar headstanding yogi to attend a yoga retreat or know the difference between your warrior poses. You don’t need to know Sanskrit or have your own yoga mat. The only thing you need to attend a yoga retreat is a sincere desire to learn, expand, and improve your wellbeing. That’s it! And honestly you’ll be just fine if you’re not there yet and would like to attend a yoga retreat to go on a fancy vacation or support a friend or partner. Myth 2: I have to be a vegetarian/vegan/(insert special diet here) to fit in on a retreat. 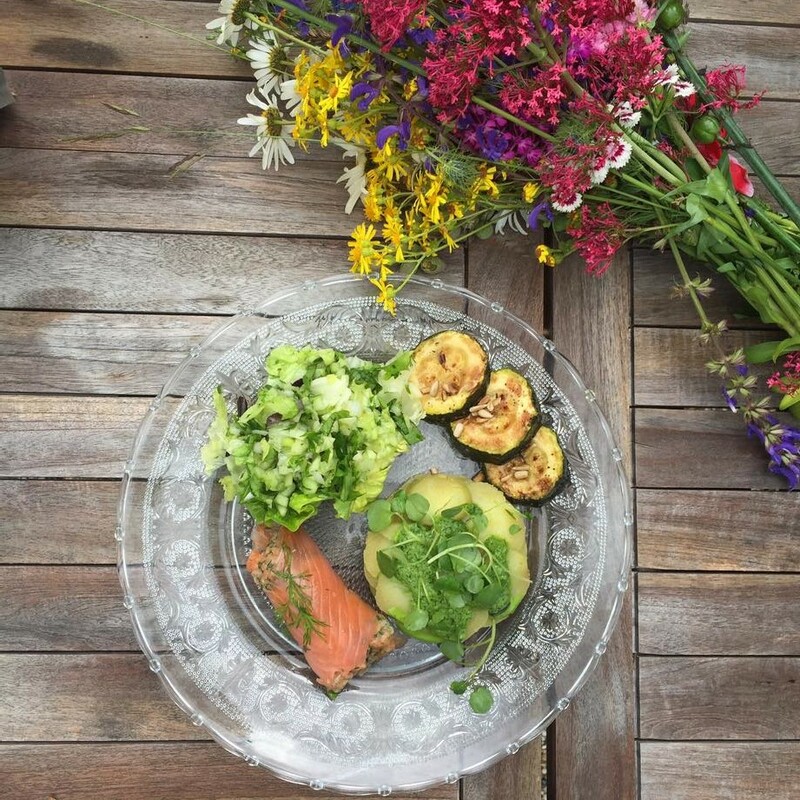 You don’t have to be a vegetarian or vegan to attend a yoga retreat. From my experience most people that attend yoga retreats are not vegetarian. Many retreats will offer a protein option in addition to the regular (typically vegetarian) menu during a couple of the evening meals or sometimes eggs with breakfast. Not sure if you can survive a week on mostly veggies, fruits and grains? You can! Retreat centers have their menus dialed in. You’ll be surprised by the variety and deliciousness of the food offered… from raw lasagna to homemade rustic breads with marmalade, creative farm fresh salads and soups, to local delicacies like seafood stew, stuffed eggplant or that famous french cheese. People who do have special diet restrictions are typically easily accommodated on yoga retreats as long as the retreat leader knows in advance and is able to give the retreat center notice. So don’t worry about what you’ll eat… it will be nourishing and divine. I always joke that I may be the only person that can attend/teach a yoga retreat and gain weight. The food is that good! Lunch at Chateau de Bardouly. Myth 3: You can’t attend a retreat solo. Say what?!?! Lady (or dude) you can attend a retreat solo. In fact, I recommend it. You will be embraced by a group of likeminded people and will form amazing friendships with people from all over the world. You may just find a lifelong retreat partner that you meet up with once or twice a year and attend yoga retreats together… I’ve seen it happen in real life! You will share stories. You will laugh until your tummy and cheeks hurt and you have happy tears pouring down your face. So attend that retreat solo. Invest in you… and if a friend does want to join in on the fun AWESOME. You’ll have an old friend to share the experience with. Want a roommate? Talk to the retreat leader. The best retreat leaders will do there best to help you find a roomie. 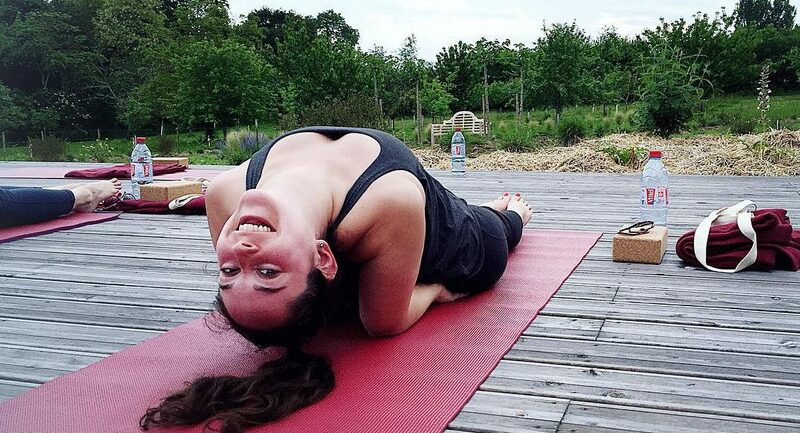 Fish pose with a smile at our Luxury Yoga Retreat in France. Myth 4: Don’t go on a yoga retreat unless you know the yoga instructor. Well, lets go ahead and say goodbye to this idea. There are so many phenomenal yoga instructors out there and you can’t possibly know them all. With the invention of the internet and cell phones it’s completely possible to connect with an instructor before attending a yoga retreat. Check out their social media accounts… Instagram, Facebook, YouTube, Twitter, Pinterest etc. and see if their message vibes with you. Get them on the phone, exchange emails or better yet Skype or FaceTime them. Instructors that are invested in their students will happily chat with you about yoga, philosophy, retreats, food, life, etc. Retreat leaders are there to support you along the way. New friends all brought together by a connection with one instructor. Myth 5: The cost of attending isn’t worth it. I can practice with my favorite teacher at home. Whether you need to rest your weary body, find your inner power, discover self love… retreats have a way of bringing about awesome transformation and healing. You’ll get out of a yoga retreat exactly what you put into it. You say, “but I can practice with them at home”. Yes, you can and you should. On retreat your yoga instructor has the leisure of time… longer classes (and seeing you everyday day) means they can weave in more philosophy, anatomy, and stories about growth, perseverance, love, etc. They can share workshops and knowledge that they just can’t squeeze into a regular group class. 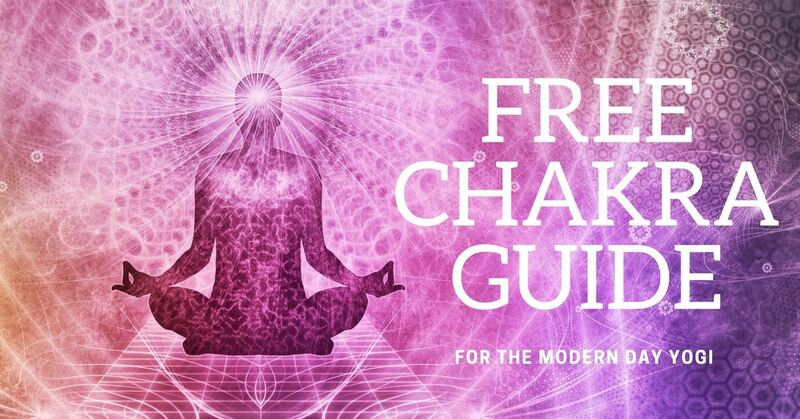 Your teacher might have a few extra tricks up their sleeve that they only pull out at yoga retreats, think dharma codes, breathwork, reiki, and shamanic journeys. 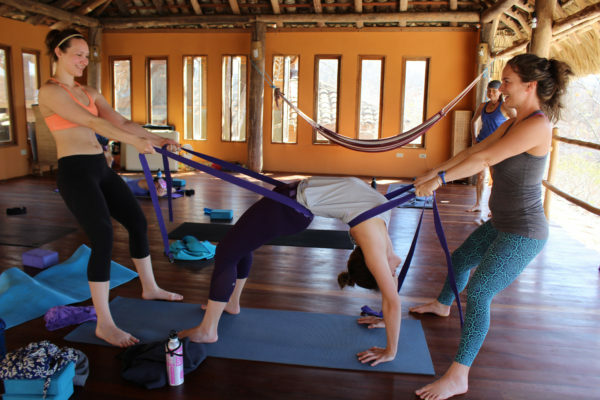 Yes, it’s true yoga retreats cost money, sometimes a lot of money. Instructors leading retreats have done hundreds of ours of prep and self study along with thousands of hours of teaching and learning so they can create an incredible experience for YOU. They are experts in their field and they put a LOT of thought into the nuances of a yoga retreat, the location, the classes, etc. If you’re struggling to find the financial means or are hesitating about attending a retreat talk to the retreat leader. They will be able to answer your questions and occasionally there are scholarships or work-trade options available. Wheel pose with a little assist. Myth 6: There is a lot of yoga during yoga retreats. Well, this is true. 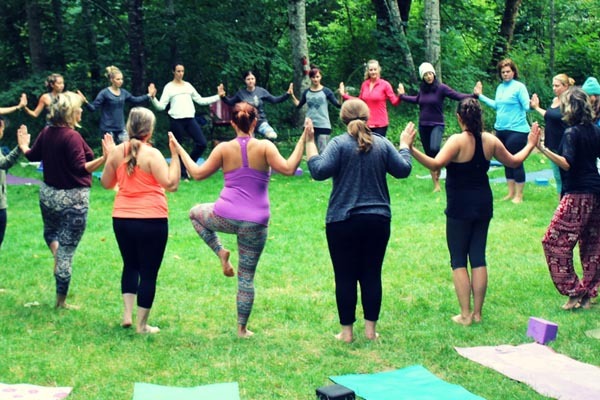 There is a ton of yoga during yoga retreats. Your yoga classes will also likely include more meditation, pranayama, and/or anatomy than they do at home. The classes are usually geared toward a certain theme, idea, or concept that is revisited throughout the week. Here’s a little insider’s secret: you don’t have to do all of the yoga. If you’re tired sleep in. If you need an evening/afternoon alone to watch the sunset and enjoy a glass of wine DO IT. We understand that this is your vacation and want you to find your perfect balance of doing and being. That yoga isn’t always intense. 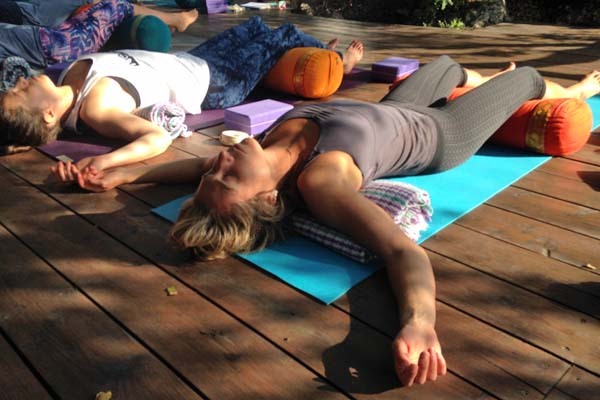 There is plenty of time to rest and restore with restorative yoga, yoga nidra and breathwork. So relax, unwind, let go of the masks, the pretenses and preconceived ideas about attending yoga retreats and enjoy your week away from the hustle and bustle of daily life while focusing on you. You’re worth it!